Must be something about blue and yellow that I don’t understand. Face it! I’d really have little understanding about passenger trains. They’re just not my cup of tea. Not that I don’t have a great little passenger train on my layout. I sometimes tie CN combine 7210 on the back of a freight train powered by a pair of SW1200rs and move it between Pearson, Winter Valley and Grande Prairie. Well, it’s prototypical for the time anyway, if not the location. But I’ve been trackside when a cab unit of some variety made it’s way past me in charge of a goodly length of silver and/or blue. Moose Jaw, Winnipeg and Southern Ontario were full of such things during he seventies. I expect that’s still true for the Montreal – Toronto corridor. In the Okanagan? No. 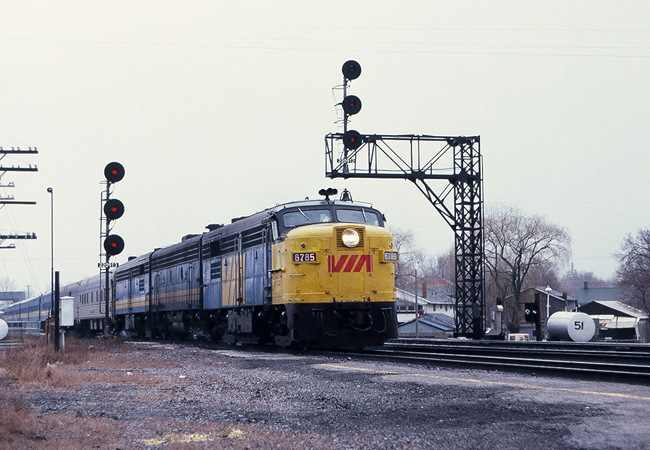 The FPA-4 has crossed the bridge, far left, and is eastbound through Belleville Ontario in early spring of 1986. This must be quite a load. Helping out are an F9B and a FPB-4, numbers unknown. A simple A/B pair, of any variety, was usually all it took to get this train across Canada. I took the photo because one of my favourate engines was being framed by a fine set of signals. It’s also dedicated to my order for a Rapido FPA/B set (stripes for sure) to be delivered, hopefully, sometime towards the end of the year. No rush thought. I don’t model HO scale and I haven’t a clue what to do with them when they get here.